Cadwallon, city of guilds by the sea, is experiencing a bit of a power vacuum. The time of the Ducal Jubilee is coming quickly and only the strongest and most influential guild will rule the city. As the leader of one of the guilds that run the city, it is your duty to secure as much influence as you can, so that by the time of the Ducal Jubilee, your gild reigns supreme. 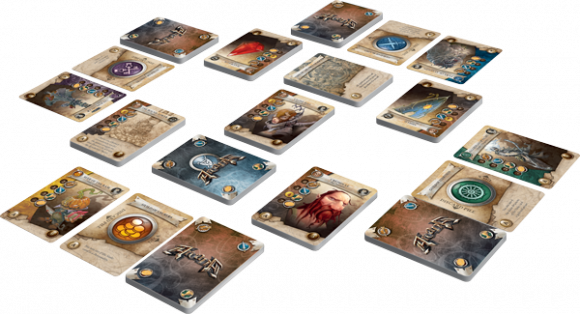 Arcana is a classic deck builder with no moving parts, thus set up is a breeze. You will first select which guild you will play as, the differences being mostly minor advantages in gathering certain kinds of cards. Secondly, you will establish districts, which are simply piles of cards in specific spots depending on the number of players (you will always have a few districts close to you, a few far away and one neutral one). The object of the game is to collect as many points as possible by the time of the Ducal Jubilee. This can be done by competing against your opponent(s) for personalities, relics and locations. Personalities are sent out to influence other personalities, gather relics and hold influence over locations. Relics are items with which you can bribe personalities to join your cause. Locations are areas in the city that provide very powerful benefits to your guild if claimed. First I would like to say that the artwork in this game is pretty good. Each personality is unique and very detailed, however each type of relic (and some of the Locations) are just copied images of each other. This shouldn’t detract from immersion, though, as the art that is there is very detailed and beautiful. Next, the game has a pretty distinct flow to it and plays very quickly. Each turn you draw your four cards, you then take turns playing cards until each player is out, then you score the districts. It’s entirely reasonable to expect a 2-player game to be completed in less than 25 minutes. However, due to the nature of deck builders, this game suffers a bit at the beginning as far as options and action economy. It’s only after you’ve built up your deck do you really start opening up the true strategic gameplay that makes this game fun. Do you want to shoot for gathering all the personalities, to keep your opponent from having the ability to collect new cards? Or do you want to focus on Locations so that you can just overwhelm them with the high point totals? The strategic possibilities are fun to play with and around. The only real downfall I experienced with this game is that you only ever have four cards at the start of a turn, and this can feel limiting. However I feel that it also opened up some very interesting ‘think on your feet’ moments that provided a very refreshing challenge. Overall, I very much enjoyed this game and it has become a regular of board game nights with my group. 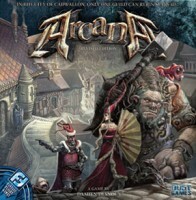 Add a Review for "Arcana Revised Edition"